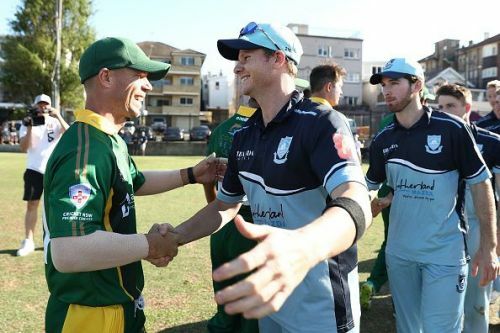 According to reports from AAP, suspended Australian cricketers Steve Smith and David Warner are expected to return to the international arena only during early May. Due to injuries and other reasons, Smith and Warner are not likely to take part in Australia's ODI series against Pakistan in March. Instead, the duo will return to the Australian setup during their Pre-World Cup training camp in Brisbane. They are set to feature in a few practice matches against New Zealand at the Allan Border Field. The one-year suspensions enforced by Cricket Australia on Smith and Warner are set to end on March 28. Both cricketers are technically eligible to play in the last two ODIs between Australia and Pakistan in Dubai on March 29 and 31. For their role in the now infamous ball-tampering scandal in Cape Town, Smith and Warner had received one-year suspensions from the national set-up whereas Cameron Bancroft was handed a hiatus of nine months. In the meantime, they continued to participate in club cricket in Australia as well as various other T20 leagues around the globe. While turning out for Comilla Victorians in the 2019 Bangladesh Premier League, Smith picked up an elbow injury and underwent surgery in January. He has been in a brace since then and is expected to begin rehabilitation soon. On the other hand, Warner also injured his elbow during his BPL stint with Sylhet Sixers. However, his recovery has gone much smoother than expected. Although he is available for selection, the Australian selectors are understood to be averse to the idea of rushing him back to action as soon as the ban ends. The 2019 edition of the Indian Premier League is shaping up to be Smith and Warner's next assignments. The tournament is slated to begin on March 23. Meanwhile, Australia will lock horns with Pakistan for a five-match ODI series in the UAE. The series is scheduled to run from March 22 to 31. All competing teams have to submit their World Cup squads on or before April 23.